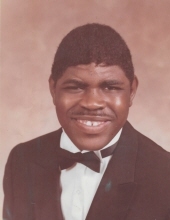 Kerry Angelo Banks, son of the late William W. and Vivian G. Banks was born on November 18, 1964. He transitioned to Heaven on Tuesday, September 11, 2018 at the Cumberland House in Farmville, VA after a brief illness. He graduated from Amelia County High School Special Education Class of 1983. Kerry was a fun loving person and he touched so many lives in a very special way. He enjoyed fishing, working on puzzles, cutting grass, shopping at Walmart, his Wii bowling game, Michael Jackson music and loved spending time with family. Kerry was dedicated to his day support job until his health started to decline. During his daily routine, he would sweep and mop floors and shred papers. He was preceded in death by his grandparents, Linwood and Geneva Banks; grandmother, Martha Hunt. Kerry leaves to cherish his memories: two sisters, Gloria Williams and Gwendolyn Holt; three brothers William Jr., Brian (Aurora) and Eric (Pamela) Banks; two aunts, Irene and Frances Banks; one uncle, Marvin Banks; a host of nieces, nephews, other relatives and friends. Devoted caregivers were: Charon Barnes, Karen Atkins, Candice Terry, Courtney Holliman, Rachel Hall, Robert Marshall, Katrina Couch, Hospice Nurse Pam Fowlkes and social worker Patty Rimby. Funeral Services Tuesday, September 18, 2018 at 1:00 p.m. at Michael W. Hawkes Funeral Home, 15001 Patrick Henry Highway, Amelia. Interment Liberty Baptist Church Cemetery, Amelia. To plant a tree in memory of Kerry Angelo Banks, please visit our Tribute Store. "Email Address" would like to share the life celebration of Kerry Angelo Banks. Click on the "link" to go to share a favorite memory or leave a condolence message for the family.